Edward Snowden, 29, has been working at the National Security Agency for the past four years and has revealed himself after disclosing America’s vast, secret programme to monitor internet users. A 29-YEAR-OLD government contractor has revealed himself as the source who leaked details of a vast, secret US programme to monitor Internet users, as the US spy chief pressed for a criminal probe. Edward Snowden, who has been working at the National Security Agency for the past four years, admitted his role in a video interview posted on the website of The Guardian, the first newspaper to publish the leaked information. “My sole motive is to inform the public as to that which is done in their name and that which is done against them,” Snowden said, speaking in Hong Kong. A former technical assistant for the CIA, Snowden worked for the NSA as an employee of various outside contractors, including Dell and Booz Allen Hamilton. In a statement, Booz Allen Hamilton confirmed Snowden had been an employee for “less than three months” and promised to help US authorities investigate the “shocking” claim that he had leaked classified information. Snowden flew to Hong Kong on May 20 after copying the last set of documents he intended to disclose at the NSA’s office in Hawaii, the Guardian said, adding he has remained there ever since, holed up in a hotel room. Hong Kong, a special administrative region of China with its own legal rules, has an extradition treaty with the United States. 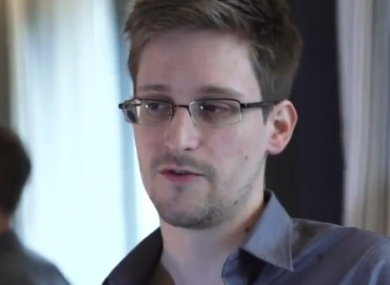 The British-based Guardian said it had revealed Snowden’s identity at his own request. The Justice Department confirmed it had launched an investigation into the disclosures but declined further comment. The leaks published in The Guardian and The Washington Post have set off a furor, with President Barack Obama and the chief of US intelligence defending the secret programs as vital to keeping Americans safe. Director of National Intelligence James Clapper confirmed on Saturday that the NSA uses a program called PRISM to gather data trails left by targeted foreign citizens using the Internet outside the United States. A separate program, also disclosed by The Guardian, has been used to scoop up the telephone records of millions of Americans. In an interview with NBC News aired on Sunday, Clapper called the disclosures “literally gut-wrenching” and said they had caused “huge, grave damage” to US intelligence capabilities. Glenn Greenwald, the Guardian reporter who brought to light the PRISM program and the separate program to gather US phone records, said the public had a right to know and openly debate what the government was doing. “Every time there’s a whistleblower, someone who exposes government wrongdoing, the tactic is to demonize them as a traitor,” he told ABC. Clapper insisted two plots have been foiled through information obtained through the programs, both in 2009 — one, a bomb attack on New York subways, and another linked to David Headley, a conspirator in the 2008 Mumbai attacks. The intelligence chief has declassified some details of the PRISM program in the face of a storm of controversy over suggestions the government had backdoor access to the servers of Internet giants like Google, Facebook and Yahoo. Internet service providers denied they had given the government unfettered access to customer data, insisting they did so only when compelled by law. Under PRISM, which has been running for six years, the US National Security Agency can issue directives to Internet firms demanding access to emails, online chats, pictures, files, videos and more, uploaded by foreign users. But Clapper said the government must apply to a secret court for permission to target individuals or entities and then issue a request to the service provider. Obama has defended the data trawls, saying America was “going to have to make some choices between balancing privacy and security to protect against terror.” There was no immediate White House reaction to Snowden’s declaration. Email “This is the man responsible for one of the biggest leaks in US history ”. Feedback on “This is the man responsible for one of the biggest leaks in US history ”.